Dan Martin got himself in the strongman’s breakaway on the final stage of the Tour of the Basque Country; looking stronger as this race went on. Dan Martin has finished 2nd on the final stage of the Tour of the Basque Country and taken 3rd overall. It was Martin’s best result of the season and he looked stronger as the race went on; a good sign for the bigger goals just ahead. Today the riders faced a very hilly 118km stage starting and finishing in Eibar. And is so often the case with short stages, the action was fierce. 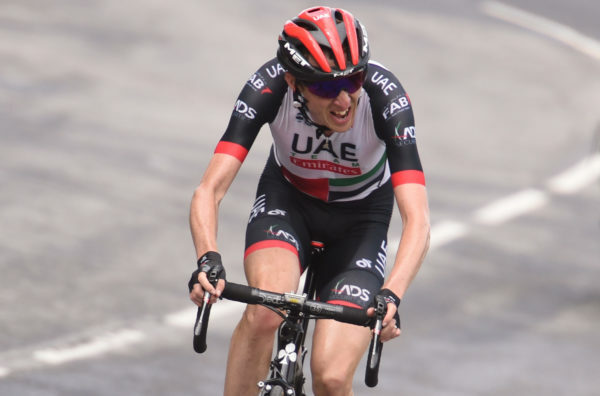 Dan Martin (UAE Team Emirates) pulled clear with his team mate Tadej Pogačar, among others. With the two team mates were the Astana due of Jakob Fuglsang and Ion Izagirre as well as Adam Yates (Mitchelton Scott). Crucially, yellow jersey Emanuel Buchmann (Bora-hansgrohe) was not present. And when the leaders took well over a minute out of those behind, it was clear the race lead would change hands. In the end Yates attacked on a late incline and won the stage solo, just one second ahead of Martin, Fuglsang and Izagirre in that order. Buchmann continued to chase hard behind and, despite following the TV motorbike off course just before the finish, he did enough to take 2nd place overall. Izagirre won overall and Dan Martin was 3rd; some 29 seconds off victory. The Irishman attacked from the front group solo with about 13km remaining. However, while he pulled out a gap Fuglsang reeled him in on behalf of Izagirre.